THANK YOU FOR ALLOWING ME TO SUBMIT THE INFORMATION ON OUR RIDE. BECAUSE OF THE LENGTH OF THE PRESS RELEASE I HAVE ATTACHED IT AS A FILE. •	Advance tickets: Entry fee is $ 20.00. Advance tickets are available at any Start & Meet-up locations as of March 11th. •	Door tickets: Entry fee is $ 25.00. •	Walk-ins and passengers tickets: are only $ 5.00. Adding to this year’s excitement will be live entertainment from 2pm to midnight. We will feature two incredible local bands. The “Hard Cover Band” from 2 pm to7 pm followed by the “Rocket Busters” from 8 pm till closing. Please plan to join us for our “Dance under the Stars” evening. 2:00 pm – Hear the Roar trophy: The one bike club or group attending with the most riders will receive our 1st annual Hear the Roar trophy. The winning club or group will take the trophy home to their club headquarters. Please make sure you register your group upon arrival at Wild Wings. 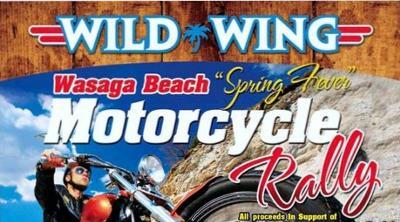 3:30 pm: Show & Shine – Prizes for 3categories: Custom Chopper, Cruiser, and Sport Bike. 5:00 pm: Best Leather Outfit award. (During the day our “CANDID CAMERA GIRL” will be looking for best Leather outfit, both women and men).